LATE Christmas shoppers hit the streets yesterday but stores admitted sales are still lagging, despite Super Saturday. However, enough last-minute shoppers hit the street to give retailers a glimmer of hope amid a dark few weeks. They are hoping the last two days of shopping may still save their Christmas but analysts fear a number of factors have hit sales. 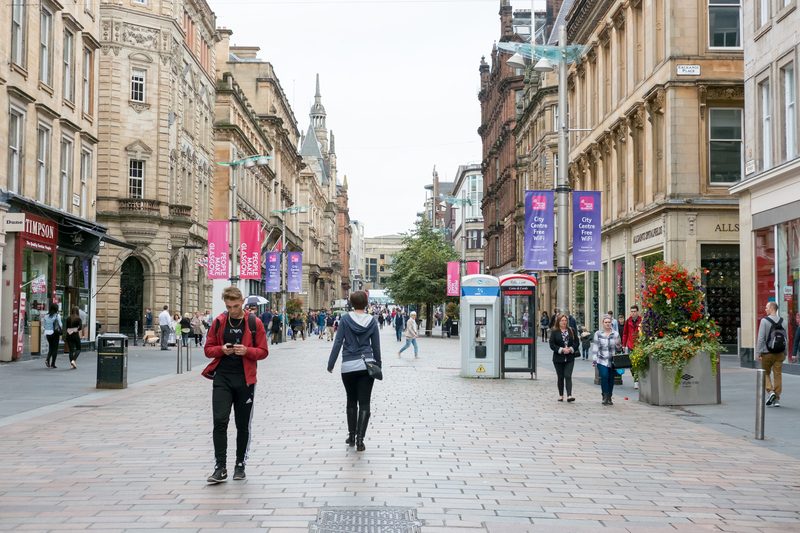 Ewan MacDonald-Russell, head of policy at the Scottish Retail Consortium, said: “We have used the phrase ‘annus horribilis’ to describe this year so far. It’s been really hard for the retail industry and a lot of big members have tumbled. “Anecdotally, the high streets have been quiet so far. It seems to be picking up now for the last rush but it’s really down to the wire. “We hope consumers are waiting until the very last minute and we have our fingers crossed for a last good few days of shopping. “If this doesn’t happen, the very significant pressures that retailers are already going through will become even harder to accommodate. In the last 12 months retail giants including House of Fraser, Mothercare, New Look, Toys R Us and Coast ran into trouble. Meanwhile, online retailers are not immune to the problems that high street shops are facing. The recent announcement of a profit warning from Asos, one of the biggest online fashion retailers, has caused concern. Mr MacDonald-Russell said: “December is worth 12.5% of the year’s retail spend and the whole Christmas shopping period is worth nearly a fifth. He said the rising cost of food meant families had less cash to spend on non-food items. Retail analysts said 63% more online retailers are slashing pre-Christmas prices this year compared to last year. The deals come from online fashion giants Asos – which recently issued a profits warning – to traditional department stores such as Debenhams. Stuart McClure, of real-time sales data firm LovetheSales.com, said: “Tough retail conditions and a long hot summer have had a compounding effect, meaning retailers have more products to sell. “Because of this, sales have already started and there are great deals to be had now. “Waiting until January means the best deals have already gone. Online, Amazon was offering hundreds of “deals of the day”, clothing retailer boohoo.com tempted buyers with “up to 70% off everything” and eBay has promotions including 60% off Superdry clothing, reductions on Canon products and up to 50% off TVs. High street retailers hit back with Gap and House of Fraser both offering up to 60% off in-store, and Laura Ashley up to 50% off in-store. Professor Leigh Sparks, deputy principal of marketing and retail at Stirling University, said shopping has changed. He said: “Ten years of austerity, squeezed incomes, a general boredom with buying stuff, worries about Brexit and altered patterns of behaviour have shaken up the market and forced retailers to think again about what gets consumers buying. Neil Wilson, chief market analyst at Marjets.com, said Asos’s difficulties demonstrated just how much trouble the retail industry was in. Yesterday, Glasgow’s Buchanan Street was busy but visibly less so than in previous years. At Braehead, Glasgow’s out-of-town shopping centre, marketing manager David Lyon said: “This year shoppers seem to have waited until the Black Friday discounts were announced before getting out of the starting blocks. Elsewhere, Dundee’s Overgate Centre saw a decrease in traffic of 2.6% from December 1 to 16, compared to last year. However, centre bosses say they have had 575,000 customers through the door this December so they are still on target to reach one million visitors for the month. Meanwhile, the rise in popularity of “experience” gifts may explain where some retail cash has gone. Brits were expected to spend £1.6 billion on such gifts this Christmas, according to research by Barclaycard. One in five people are expected to give an experience-based gift this year – a rise of 115% on last year.